“Cleaning is my favorite pastime,” said no one, ever. Hey, I hear you! But the joys of living in an orderly home speak for themselves. Spring Cleaning is the time to get rid of the gunk and junk. You’ll thank yourself the rest of the year. If you came to my house right now, I promise you would not find me cleaning. I don’t usually keep a cleaning schedule. Ok, sure, I clean things, but only when they’re dirty. I don’t scrub the floor just because it’s Tuesday. Plus, I’m pretty sure dirt isn’t nearly as unhealthy as we used to think (or so I tell myself). I do, however, like to set aside some time each Spring to give the house a good top-to-bottom scrubbing. It’s also the perfect opportunity to sell & donate the “junk” that accumulates throughout the year. My family tries to be diligent about not filling our lives with useless things, but it somehow still sneaks into our lives. Declutter & Organize Everything. Every. Thing. 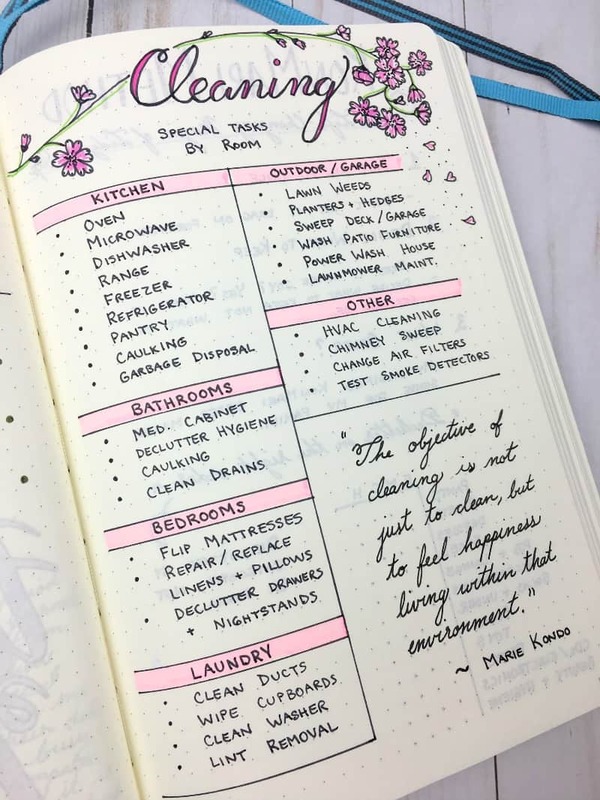 I accidentally created my KonMari page after the Spring Cleaning pages, but I do the decluttering first. Cleaning is so much easier when you don’t have to move piles of junk. So, decluttering. This is where my love of stationery and journaling comes back to bite me. I don’t buy many kitchen gadgets, or clothes, or electronics. Our kids have relatively modest toy collections. I don’t go for music, movies, or books (Oops. Not true. I have hundreds of books on my Kindle). But pens? Paper? Notebooks? Sweet sassafras, I have a lot of stationery supplies. Part of that is the blog. 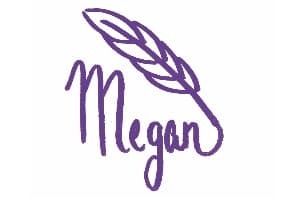 I like to try things so I know if I can recommend them to you. So really, you’re to blame, right? Nah, just kidding. In all seriousness, I do have to clean out my office area once a year to keep it under control. 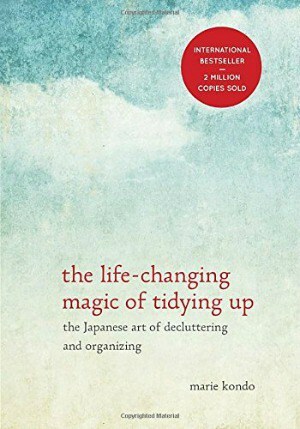 I recently read The Life-Changing Magic of Tidying Up by Marie Kondo. She had a few ideas on organization I hadn’t heard before, so I decided to incorporate a few of them into my 2017-Spring-Cleaning-and-Organizing-Palooza! 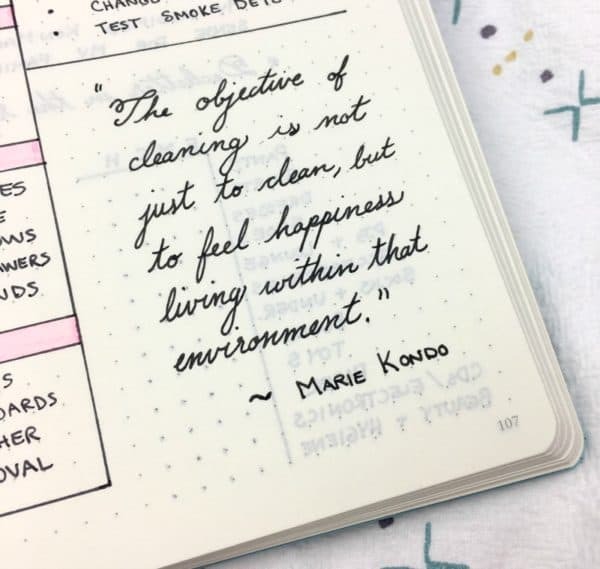 Love Marie Kondo? Make sure you check out my full list of 10+ Books to Improve Every Aspect of Your Life. Tidy all at once: This is a great point. If your decluttering rate is slower than your cluttering rate, it’s never going to get done. Just do it already! Organize in the right order: Marie Kondo recommends against decluttering by room. Since I’ve always done it by room, this was uncomfortable for me. Hey man, change is hard! 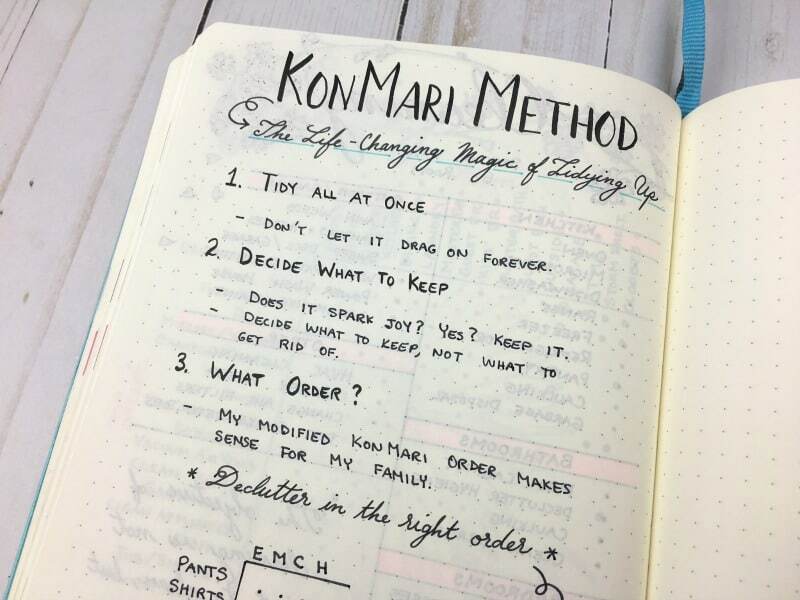 I decided to give the KonMari method a chance. I like the idea that I can get the whole family’s clothes situated before getting sucked into toys or books. Everything has a place: Ask Mr. Page Flutter about this one…He can remember where he put things (even if the location makes NO sense to me). I can’t do that. I need a designated place for each item in my home. It should always go back in its spot. Just like your mamma taught you. 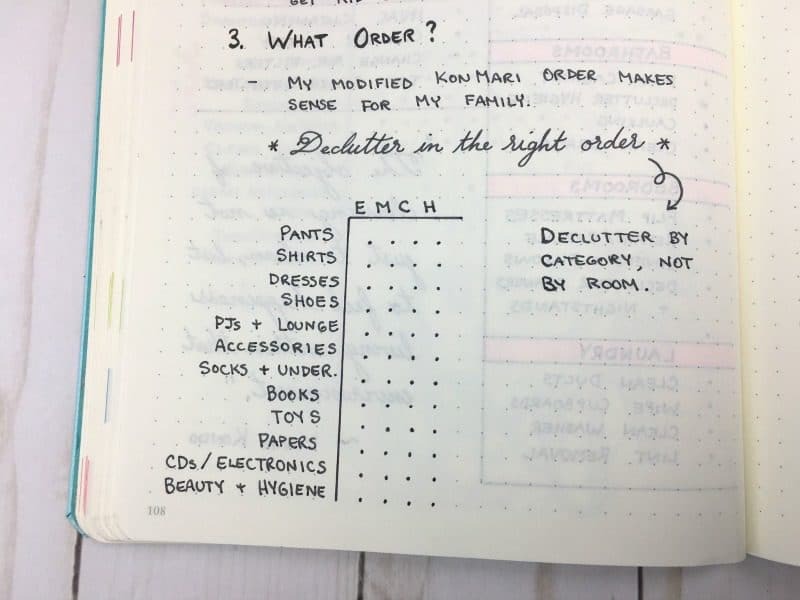 I made this little chart to track the decluttering for each member of my house as I got through them. So, I can tackle clothes for the whole family, books and toys for the whole family, etc. Remember how I said I don’t like cleaning? It’s so true. What I dislike even more is having a cupboard crammed with half-empty bottles of cleaning supplies that only do one thing. One bottle for the toilet, one for the mirror, one for the countertops, one for the tub, one for the tile, one for the…Argh! I like products that have more than one purpose and keep chemicals to a minimum when possible. The white vinegar and baking soda are especially versatile. Dry Swiffer: For lint, dust, and pet hair. I also use the dry Swiffer pads to dust my furniture. My Hoover Windtunnel: Full disclosure on this one…Mine is an older model, and it’s was significantly more expensive when I purchased it. I noticed the reviews have dropped a little, too. Something may have changed. As for mine…I’ve owned a few vacuums, from cheap to very expensive. This has been THE BEST vacuum and it’s priced very reasonably. Shark floor steamer: Sanitizes my floors with only water. My kids are always crawling on the floor, so I try to avoid chemical cleaners. J.R. Watkins All Purpose Cleaner: This stuff smells incredible! I use it on just about everything. 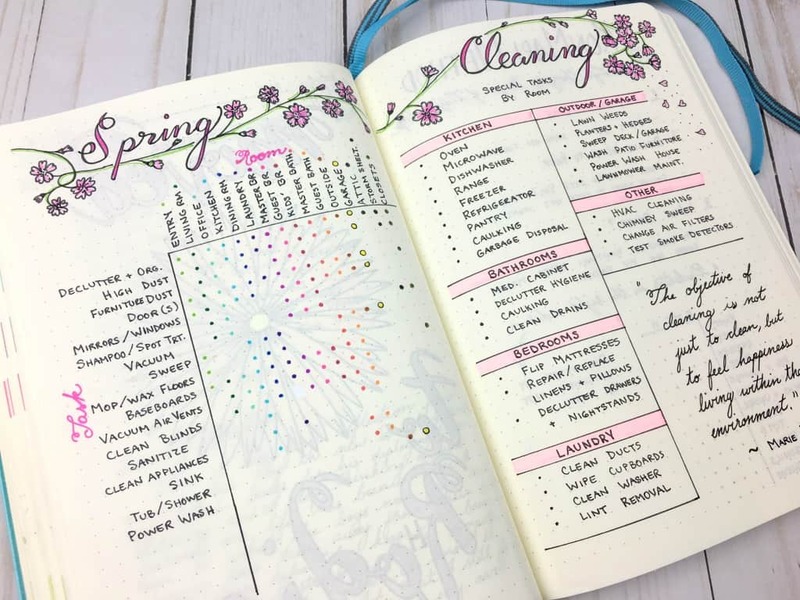 I created my Bullet Journal spread as a chart, rather than a straight checklist. Since I’m trying the KonMari approach and decluttering by category, I thought I might also try cleaning by task instead of by room. I wasn’t sure if it would work for me, so I gave myself an out. 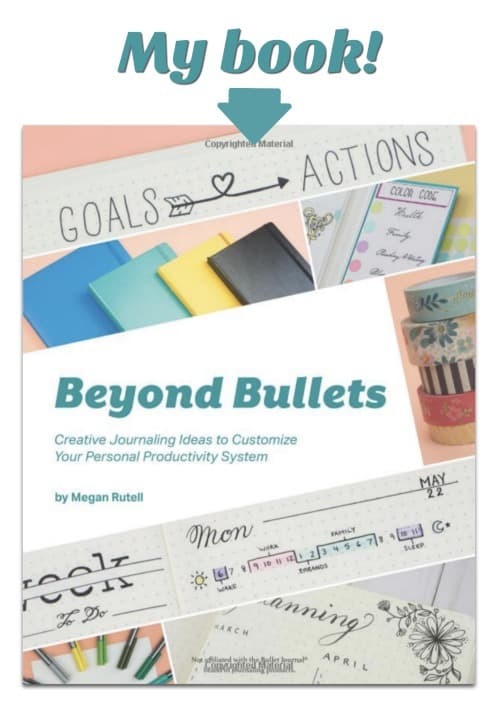 I charted each task that needs to be done, then color coded the bullets by room. If I decide to tackle them by task, I follow the row. For example, I could dust all the baseboards in the house and cross of that whole row. Alternatively, if I’m on a roll in a given room, I can flip the spread sideways and mark off bullets for that room. Most of the tasks on this spread are big-picture, whole-house kind of tasks. The next page has a complete list of specialty tasks each room has to offer. I couldn’t envision these tasks in the context of the whole house. I needed to envision the room and think of everything in it that needs special attention. It might be a bit redundant, but it helps me ensure I haven’t missed anything. This part is pretty straight forward. I just check off each task as I get it done. Then I sit back and enjoy my clean, organized house. Ahhhhh. 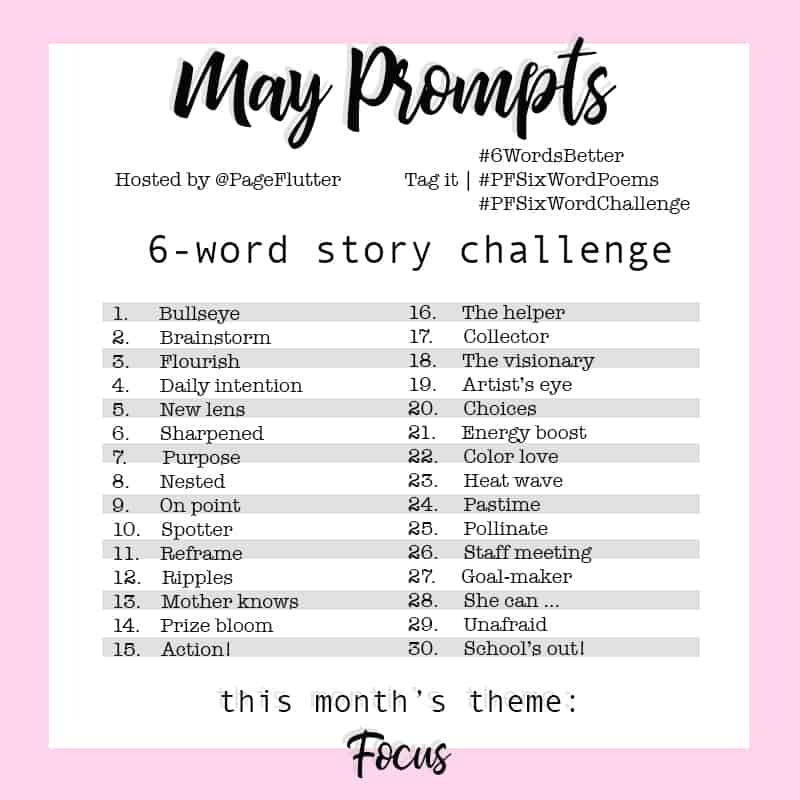 What are the biggest challenges you face with organization? 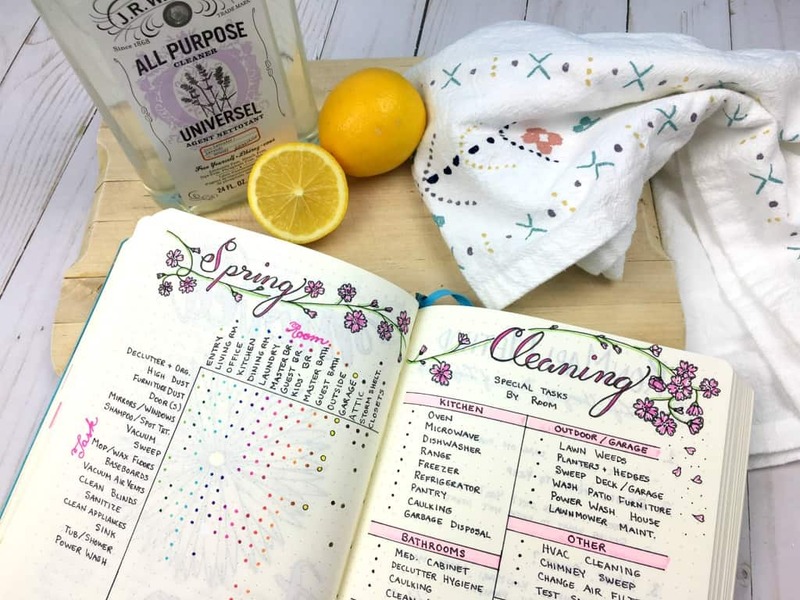 Comment below to share your cleaning, organizing, and journaling tips. Want access to free printables like this one? Sign up for my newsletter and get instant access to the Page Flutter Vault, a resource library for my subscribers. 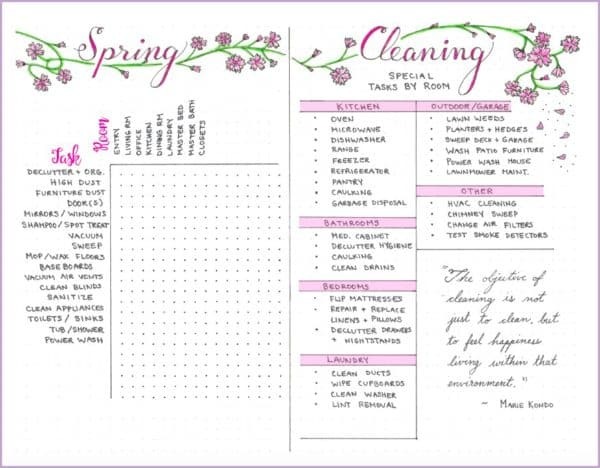 Yes, please, a printable version of the Spring Clean…I can really make a go of cleaning with this. Thank you!! Have a blessed day. Please do set up a printable version of the Spring Clean. I am so lost, and really need a road map like this. Hope you do. Thank you so much. Finally found the password, so grabbed a couple of ‘signs’ to put up to think Spring, even though snow is still on the ground. Yes please!!! I subscribed to get access to the vault but no password has arrived. I am having the same issue Stefanie, did you ever get in to the vault?